Feed onto the shaker table generally consisted of 0.8 mm size material from the hammer mill through the “Feed Box”. This material was mixed with water and moved across the riffles on the shaker table. The less dense material moved down the table into the Tailings launder, while slightly more dense material moved into the Middlings launder. Together, the tailings and middlings accounted for the bulk of material that was processed at Thor. All the materials that moved into these two launders were disposed of in the tailings pond. Each of the products did contain gold that was unable to be recovered by the shaker table, and this was due to the grinding size of the hammer mill. Each day, samples were taken from the Tailings and Middlings launder, and this served as a measure of the amount of gold that could not be recovered with the mill. Optimize grinding to recover as much of the gold as possible. 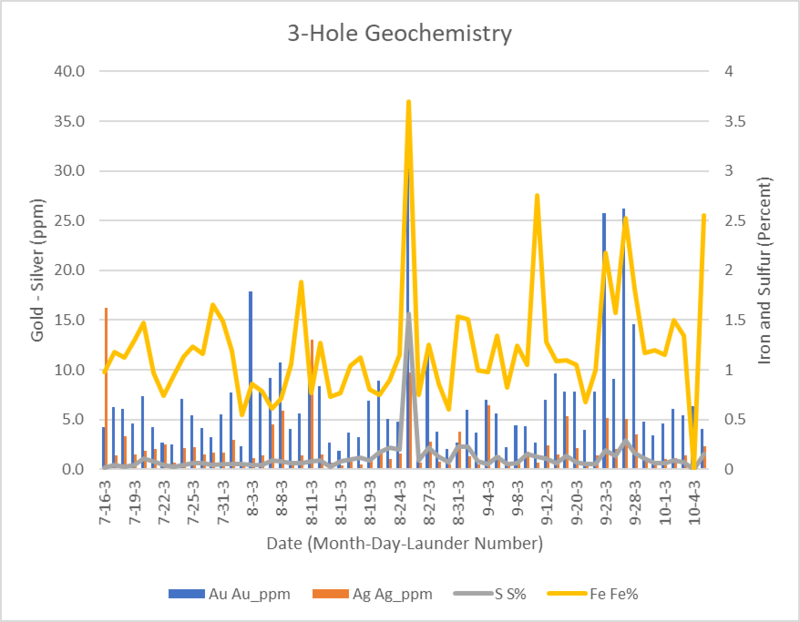 Sampling was undertaken on the number 3 hole ('Middlings') and number 4 hole ('Tailings') once a day for each of the products, and this characterized the material that was going to the tailings pond and material that was not recovered. 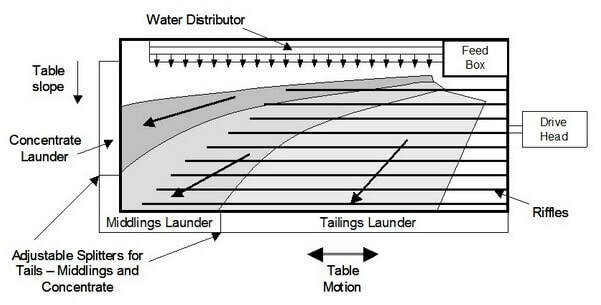 The following figure shows the layout of the shaker table and how the material reports to the launders (holes) on the shaker table. Plan view of the shaker table and the names of the various products that are produced from the plant. Note - the concentrate launder at Thor has two separate holes, named the super-concentrate and the concentrate launders. The following two graphs show the gold and silver content of the two waste products (Middlings and Tailings) for the entire 68 day operation of the Gold Pilot Plant at Thor. The left side of the graph shows the gold and silver content in grams/tonne. Note how little silver there is in the product, and the precious metal content is chiefly composed of gold. The right side of the graph shows the iron and sulfur content of the products, and except for a brief spike in the early part of August, there is very virtually no sulfur in the two waste products.